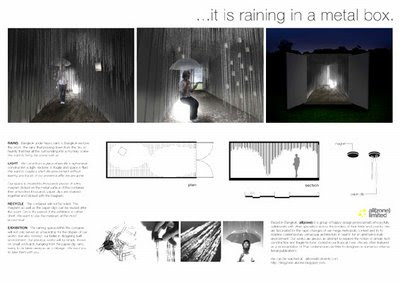 42 It is raining in a metal box..
We began the new year 2009 post with our old project. It is a project waiting in line to be posted already for some months. Just the other stories are more related to the ‘now’. However, finally we are very happy to be able to post this one on our blog since we like it very much (as usual). For the last year Tokyo Designer’s Week (during October every year), there was a very small competition to design an exhibition in a container, which was a venue for everyone in a park. The winnners were awarded a free space and a very little budget to realize the exhibition there during Tokyo Designer’s Week. Plus a wide range of publicity was guranteed. 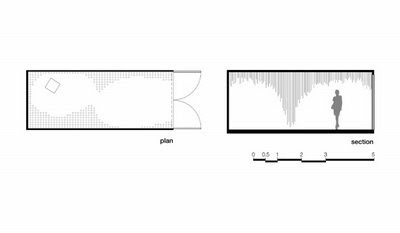 We did not aim to win the competition, (and we did not win) but the design condition was challenging for our brains……. Imagine if we won and had to go there to set up everything with very little money… must have been a little hellish…:O (I lived in Tokyo for three and a half years, perhaps I knew too much to be optimistic). 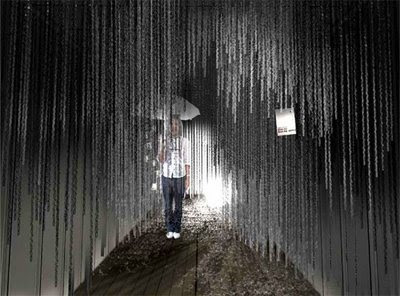 Here is our entry “it is raining in a metal box”, upon the requirement – only one A3 sheet. Our idea is very simple. It comes from the condition that if we really had to go there to set up the exhibition with very little money supported from the organizer. 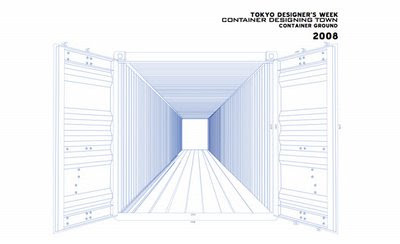 Ok, surely we had to spend the travelling expenses and living expenses from our own pockets.. but then, still, with 60,000 yen in Tokyo, you could barely buy some cardboard to cover the interior space of the container. We, therefore, thought of something very light (as usual) very cheap (as always) and very easy to bring from Bangkok.. This is our starting point – metal paper clips and small piece of magnet. 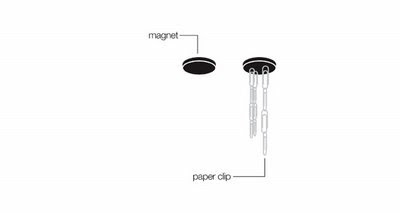 The magnet acts as glue to keep paper clips attached with the surface of the container which is, of course, made of metal. They really look like lines of rain dropping.. So we proposed to create the whole space of the container buy this hanging paper clips.. Since they are very light and easy to handle, to shape space in any configuration would be very easy. We can even change the space everyday. RAINS: Bangkok under heavy rains is Bangkok we love the most.. the rains that pouring down from the sky so heavily that blur all the surrounding into a mystery scene. We want to bring the scene with us. LIGHT: We come from a place where life is ephemeral, construction is light, tectonic is fragile and space is fluid. We want to creat a short-life environment without leaving any traces of our presence after we are gone. Our space is created by thousands pieces of a tiny magnet sticked on the metal surface on the container, then a hundred thousands paper clips are chained together and sticked with the magnets. RECYCLE: The container will not be holed. The magnets are as well as the paper clips can be reused after the event. Since the period of the exhibition is rather short. We want to use the materials that most economical. 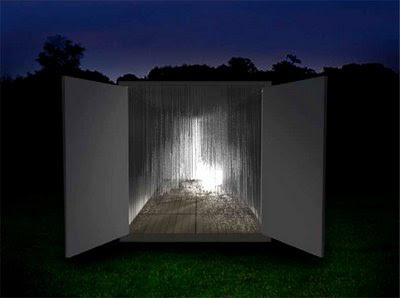 EXHIBITION: The raining space withint the container will not only serve as a backdrop for the display of our works, but also conveys our belife in designing built enviroment. 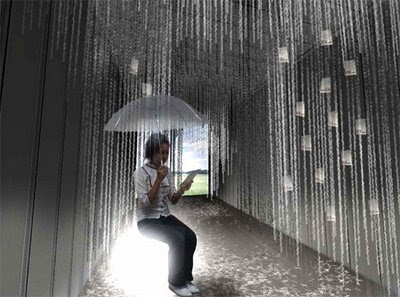 Our previous works will be simply shown on small postcards hanging from the paper clip rains.. ready to be taken as an o-miyake. We want you to take them with you. With some lightings, the space looks pretty mysterious.. and really I think it looks as if it is raining in the box, well, the container. We calculated roughly, the cost of the exhibition would be about 20,000 yen for the materials brought from Bangkok, and then perhaps 10,000 yen more for the lighting.. Not bad in our economic crisis, isn’t it. Well, we surely will try to find a chance to realize this idea very soon.